Although rare, multi-ligament injuries to the knee pose great challenges to both patients and treating surgeons. Historically, these injuries were treated non-operatively with bracing and gradual rehabilitation to regain motion once the knee had become stiff and stable. Higher patient and surgeon expectations, together with advancing reconstruction techniques and a high failure rate with surgical repair alone, have led a shift toward surgical management with ligament reconstruction (Geeslin et al., Am J Sport Med. 44:1336–1342, 2015 . The goals of surgical intervention are to provide the patient with a stable, well-aligned knee that allows for ambulation. In the treatment of these complex injuries involving the ACL, PCL, and postero-lateral structures, many unanswered questions still remain. 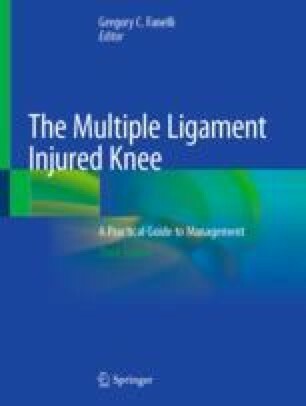 The optimal timing of surgery, repair versus reconstruction, alignment, and graft choice will be addressed briefly in this chapter; however, the goal of this section will be to focus on surgical technique for repairing and reconstructing the knee with an acute and chronic combined ACL, PCL, and PLC injury.